We can debate the merits – or lack of them – of the transport projects announced last week till the cows come home but one thing is certain. If they are all to go ahead then we will need to sort out is how we are going to fund them. Due to the way our transport funding system is set up there are some quite key differences between the projects as some are considered local projects to which the Govt/NZTA contribute 50% of the funding while some are state highway projects which the NZTA pay for in full. 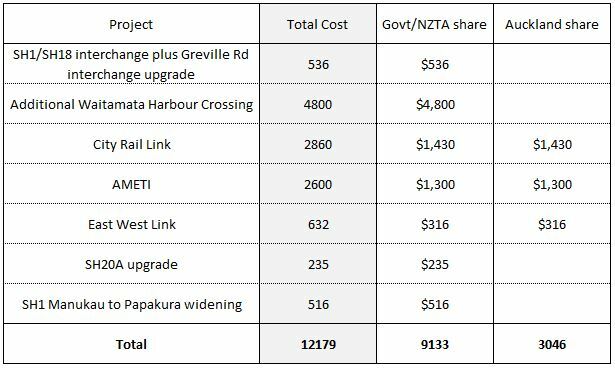 Here is a quick table of the projects along with the NZTA/Govt and Auckland Council funding share. Total price is as per the figures in the ITP, also note I have used widely quoted price for the CRL but I expect that to come down considerably over time. As another example of just how rushed and political the decision was to agree to these Auckland projects, there was no mention of how the government would fund it’s share. During the announcements last week, the prime minister suggested that Gerry Brownlee had now been tasked with finding the funding to make these projects happen. One of the key parts to the announcement on Friday was that with the exception of the Harbour Crossing the projects not yet underway are going to be fast tracked to get them built/started within the next decade. Taking out the Harbour Crossing means the government has to find roughly $4.3 billion – although they say the CRL won’t be paid for out of normal transport budgets – while the council needs to find just over $3 billion. Looking at just the governments share for the time being it is clear that funding is not going to be easy, the existing transport budgets – for which funding comes primarily from road taxes (Fuel Excise Duty and Road user Charges) – are already strained due to the expensive and overblown Roads of National Significance (RoNS) programme. The 3c per litre petrol tax increase this week, which will be repeated again in the next two years, was purely to help pay for these projects. Increasing road taxes further to help pay for this Auckland focused transport programme is likely to go down like a lead balloon in rest of the country and with many within Auckland. It’s also not clear that further increases would raise enough revenue. This cabinet paper lead to the current round of increases to road taxes. It suggests that even with a 3c per litre increase every year for three years, then increases at the projected growth of the Consumer Price Index that only an additional $1.7 billion would be raised over a 5 year period. That doesn’t even come close. If we exclude the CRL from the funding list seeing as the government has said it won’t come out of our normal transport budgets then to fund their share of the various roading projects the government will need to raise roughly an additional $2.9 billion. To get that level of funding through the traditional sources would likely see petrol need to rise by a similar level to the programme we are on, in other words an additional 9c per litre over three years. If it were to start next year then it would mean that over a four year period that road taxes would have risen by the equivalent of 18c per litre. Of course that doesn’t take into account what such an increase would have on people’s willingness to drive. We are already seeing vehicle volumes not growing or in some cases falling placing the funding stream under even more pressure. Now going along in the background to all of this has been the consensus building group (CBG) set up by Len Brown which has been looking exactly at the issue of how to fund Auckland future transport projects. They looked at a number of options for how to raise funds to pay for a large amount of (mostly unneeded) transport projects and ended up seeking submissions on two options, one based around fuel taxes and rates and one based around using road pricing. Readers will probably remember the reaction of Gerry Brownlee to these options as he effectively ruled out both the option of road pricing and regional fuel taxes making both seemingly impossible. However with the government now agreeing to support a large number of expensive projects and needing to find a way to fund them, I suspect we might see a shift in this attitude – much in the same way we saw Gerry initially rubbish the City Centre Future Access Study only to now say that the government broadly agree with it. Gerry himself now says that they are watching closely the outcome of the work from the CBG. I have wondered how much of the opposition to the funding options has been due to the options themselves or to the fact it was set up by the council to help pay for projects that the government were opposed to. I have also wondered how Brownlee’s/the government’s stance might change if the money raised by the extra funding was able to be used on these state highway projects. The government traditionally funds the full cost of projects on the State Highway network which are strategic roading links around the country. In my view the Waterview Connection currently under construction effectively completes the strategic road network in Auckland and the motorway projects being proposed not in response to growth in interregional demand but due to growth in local demand. Despite being on the strategic highway network, the need for expensive widening and upgrading is purely due to the amount of local demand that these roads experience. To me this raises the question of whether these projects should be funded solely by the government purely because they sit on the strategic network of if they should instead have the same funding arrangements as local road projects like AMETI, the East-West link or the CRL. I’m sure the government would love to put even more funding pressure on the council but in turn how would the realisation of how much we need to spend change people’s perception of the projects announced. Would it make people start to question the wisdom of continual motorway widening that never seems to achieve that much? What do you think, should we fund these motorway projects the same way as we do local roads? Nice post. That AMETI cost figure of $2.6b seems about $1b too high. Maybe Gerry will reallocate money away from the idiotic Wellington RoNS? As much as I dislike the Wellington RoNS, it’s the only investment that this government is putting into Wellington at the moment. Wellington was the only major NZ city not to have an announcement on infrastructure development. But a bad investment is worse than no investment, ie not going into debt, which is what that proposed PPP is. Welly has always had a lot of love because it is the capital: Te Papa for example. Otherwise it would still be a charming fishing village and not the lovely city it now is. Perhaps the real question is what does deserve funding in Welly now? A higher-capacity PT spine (BRT or light rail) through the CBD and Te Aro, a road bridge over the Waikanae River (where the Kapiti Expressway bridge will go, but without the whole expressway attached), and the long-delayed Grenada to Petone road. Those three should keep Wellington going for about 20 years, and put together they’re way cheaper than Transmission Folly. There must be way to compare the value of these various projects to figure out which are most worth paying for. Oh, wait.. The big but as asked in this blog, where is the money going to come from to fund not only the motorways but their infinite upkeep. Its proven in Auckland that the more motorways you build the more they need to be widened and expanded at some later date, they are expensively self perpetual. And it really begs the question, does this government know what it is doing with the economy of NZ with this fairly reckless commitment of money on motorways and given as the NZIER says, the growth in our economy at the moment is based on the CHCH rebuild and the foreign debt fuelled Auckland housing bubble. I suggest not. Matt, If the additional Waitamata crosing has a rail line associated with it, I can see the goverment expecting Auckland to contribute to the cost. And how much have they borrowed so far to fund the tax cuts? I note that the CRL cost is the inflated cost, not the “today’s dollars” cost. Is it the same for the other projects?